On Aug. 11, Catherine Hedges, founder of Don’t Bully My Breed, passed away after a long battle with breast cancer. Catherine was a lifelong animal lover and animal advocate. 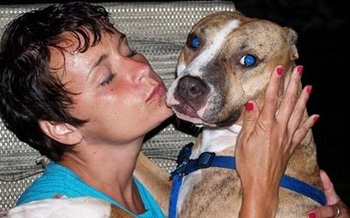 She started rescuing pit bulls after volunteering to help the dogs impacted by Hurricane Katrina. This prompted her to found Don’t Bully My Breed, an advocacy organization dedicated to the welfare of bully breeds and other companion animals. The nonprofit assisted with spay neuter, fought breed-discriminatory legislation, educated the public about bully breeds, fought dog fighting, and assisted with the rescue and adoption of homeless dogs. Catherine’s life work will live on in the many dogs she helped save and the lives she touched. What a sweet story and loving caring person! Catherine Hedges, we miss you – you made the world a better place! @Anne Thanks Anne, she sure did make the world a better place. Although I didn’t know Catherine, I know people like her. People who care and are willing to make a difference. It always sad when an advocate dies. It’s like losing a member of the family and in a way, it is. We’re a tight knit community, everybody shares successes and failure is not looked at as failing rather another attempt to try again. If I have learned anything from Catherine is that you persevere and believe anything is possible. I like to think we ALL have some Catherine in us, we just have to look. @MacKenzieSerpe That was beautiful, thank you. So sad when someone so good leaves. But she is over The Bridge…..
God needed her on the other side to help the animals that died from cruelty,now he can rest because he know’s Catherine is there helping them heal with all of her love.God shared her only for a little time,he needed her back.She is still with you all and my prayers go out to her family/friends and the animals that loved her too.God Bless you Catherine and thankyou for all you did.You will be missed. @BrendaPelletier Thank you Brenda for those beautiful words, she truly touched so many, both human and animal. I wish I could have met her. I have followed her work, loosely, for years. I’ve always been too busy to really dive in, but I appreciated her work greatly! Before Don’t Bully My Breed, Catherine was in Chicago, and had founded the Furry Friends no-kill network, advocating for bully breeds and other animals as tirelessly as she has been known for. Her writing, as well as her rescue efforts, helped greatly to change the light in which bully breed dogs were viewed. She had an incredible drive. Absolutely inspiring! @RebeccaBurckhalter Thank you Rebecca, she was incredible inspiring. I never met Catherine in person but we communicated often via email. We would contact each other asking about breed identification, to ask if the other has heard of a rescue and to ask for help with pitties in need. I saw firsthand Catherine’s passion for animals and believe she was one of the most selfless people. I am so saddened she is no longer with us and I will truly miss her partnership and positive outlook. May she rest in peace. @ShanaKlein Thank you for sharing your personal experience with her. We were lucky enough to find our sweet girl through Catherine and DBMB in 2009. I am saddened that I just learned of her passing this past Saturday through a client who also happens to operate a canine rescue. I, too, never met her but spoke to her several times and the gripping passion I felt from her will stay with me as long as I live and continue to love and save dogs. May we all continue her pledge to help as many as we can, both animal and human, and honor her efforts as a champion of the loved, not lost. God rest thee gently, Catherine. @donnieboy67 Thank you for sharing your experience with Catherine. She left a tremendous legacy and we hope that it will continue with the same passion as Catherine had. @shadylady13 Yes, taken too early, the world was a better place with her in it. I just want to say that Catherine was a personal friend of mine. I first met her a pet owner who came in to the vet office I worked for. She became my neighbor – 2 houses away- and we became fast friends. I have to say that her work with animals was every bit her professional life as it was in her personal life. I would spend lots of “leisure” time with her, doing pit bull advocacy, rescue work, and more. She was a beautiful, wonderful woman, with the biggest love of animals I’ve ever seen. My life is better for having known her.